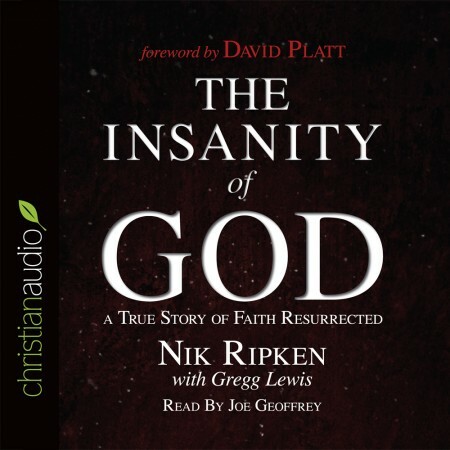 I had heard The Insanity of God by Nik Ripkin (pseudonym) was good. I even had a digital copy of it on my ereader, but I just never got around to reading it until now. It lived up to the hype. The full title of the book is The Insanity of God: A True Story of Faith Resurrected. Ripkin tells of how he became a Christian, got married, and got appointed as a missionary to Africa. Once there, he ended up doing relief work in Somalia—he was in Mogadishu during the events portrayed in the book and movie Black Hawk Down. The things he experienced doing this relief work and a personal tragedy shook his faith. This led him on a journey through many countries to meet with and learn from persecuted believers around the world, which ultimately breathed fresh air into his faith. Ripkin’s story drew me in. So many of the stories were heartbreaking or tense, yet there were moments of sudden relief, unexpected humor, and even joy. It’s not surprising that Ripkin struggled with what he was experiencing—feelings of doubt, failure, and being overwhelmed. As I read, I found myself challenged as well. This book wrestles with the problem of evil, miracles, God speaking, and persecution. It’s not systematized like a textbook. It’s stories. Much like the Gospels and Acts, the narrative calls for a response. I feel invigorated after reading The Insanity of God. I’m in seminary, but I don’t just want my knowledge to grow, I want my faith to grow. This book has reminded me that believing God isn’t merely about knowing certain things and holding certain positions. It’s about trusting in him more today than I did yesterday, and acting on that trust more and more. It may end up having a bigger impact on my walk with God than any other book I’ve read this year. I wish I had read it sooner. I received a copy of the audiobook from christianaudio for the purpose of review.